TBS, a free-to-air TV channel in Japan, is broadcasting “Marry me Mary” on 20 May. Jang Keun Suk and Moon Geun Young attended the press conference in Korea today. 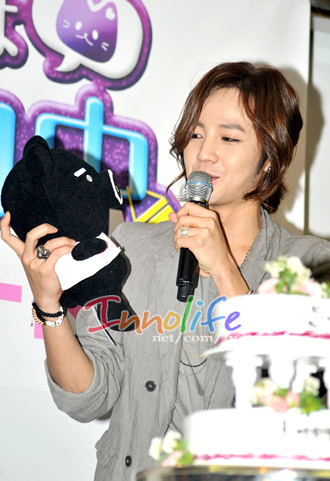 The stuffed toys that both were holding are TBS’ lucky mascot. omg..”marry me mary” will be aired in Japan.. I think it’s because they are really close to each other in real life (they make a perfect couple both in terms of looks, experiences and personalities), that it’s actually awkward/shy when they need to appear together “professionally” in front of the public eye! You know how’s its like – when one appear infront of someone whom one REALLY likes, one tends to behave in an “abnormal” way. 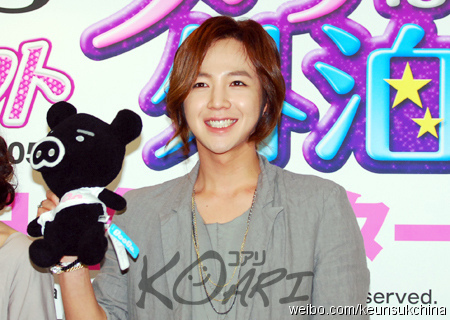 ie he who is usually talkative, playful and lively (like Keun Suk) would suddenly behave all calm, serious and gentlemanly. Looking back at all their previous videos, Keun Suk tends to behave this way around Geun Young. The 3rd picture from the top, I could totally see them as a young husband and wife going to the supermarket together. CUTE! P.S. in the 3rd picture from the top, the two of them are standing so close together, shoulders touching! Ya, they looks so lovely. they have nice chemistry together,,..
they are sweetly pretender….but they’re great..
do they see each other???? ?after the cri show in singapore??? hope to see some pics of them together…. This drama is crazy but I still hope it will do better in Japan than in Korea!! I agreed. There is no plot in this drama. That’s why get quite low rating. I still prefer YAB. The main purpose i watch this drama bcoz of JKS. Omg, why MGY become so “ajumah”, sorry to say that ya! MGY’s fan dun b offended. She looks totally diff as compared to last year KBS award. agree with u, I think it’s her short curly hair and her ahjumma dress …. Geun Young is dressed that way because it is the press conference for Marry Me, Mary and that’s the “look” that Mae Ri, the character has. Look at her recent Basic House commercial shoots and you will see how chic she can be. She’s as versatile an artiste as Keun Suk is. Wait, where’s Jung-In???!! He definitely should be there too, his chemistry with MG should definitely sells the drama!!! Plus, while watching the drama I kept wondering where I’d seen Jung-In, that’s just when it ended that I found: my japanese childhood friend looks just like him and he’s a hottie, the actors who portrays JI will definitely have lots of success in Japan! I’m still worried about his condition. I agree with this, maybe they put a lot of make up because he looked tired, but he just look like a zombie! Geun suk gain some wight which is good because he was so skinny back then and that I know he is eatting well…. It’s not that I prefer PSH and JGs but they look more like a couple than JGS and MGY, I don’t even think this 2 are friends they just play it for the fans IMO: THey don’t look friendly at all. i think JKS make up is too white and at the Singapore FM he looks so skinny!